Argon, Neon, Sodium, Xenon, glamour, glimmer, sparkle, shimmer... Recurrent words and themes dominate John Foxx’s cinematic album of 2001. The Pleasures of Electricity – the follow-up to 1997's comeback album Shifting City – is an album of varying moods and atmospheres, fully embracing Foxx's love of big cities and the technology that surrounds us. The influence of Kraftwerk musically and lyrically, is present throughout the whole of this album. It may not be Foxx's most innovative work, but with its minimal electronic sound, The Pleasures of Electricity takes you straight back into Metamatic's vast city of neon lights, moving stairways, high-rise buildings and an ever-evolving concrete skyline. From taking a flight to taking a photograph, the album's lyrics touch on the everyday details of urban life. Each song is like a little grainy monochrome movie, so visual, reflective and emotive. Songs such as "Quiet City" and "A Funny Thing" have a feeling of solitude, recalling the mood of 1980's “This City”. "Automobile" and "Travel", as their titles suggest, focus on transportation, the latter also looking at relationships, as do "When It Rains" and “Uptown/Downtown”. "Camera" brings a warm sense of reflection and nostalgia, and "The Falling Room" is perhaps the alum's most diverse track, starting with an eastern melody, and featuring the album's strongest vocal performance. 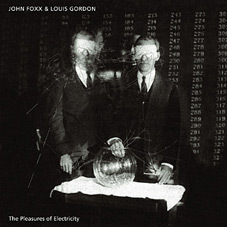 The Pleasures of Electricity is littered with recurring themes that any John Foxx fan should already be familiar with. 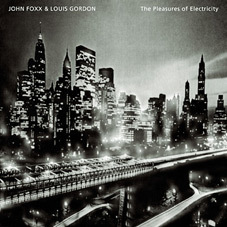 If anything, The Pleasures of Electricity is Foxx's closest album, musically and lyrically to Metamatic – to the extent that “Invisible Women” shamelessly recycles the riff from “Underpass”. Ever since John Foxx had bought a second-hand grey suit in the late 1970s, the smartly dressed “quiet man” image has been a recurring theme throughout many of his songs. 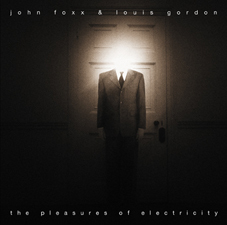 So it comes as no surprise, that Foxx's own artwork for The Pleasures of Electricity features a man in a grey suit. The dark figure's head is an explosion of bright light, clearly influenced by René Magritte's painting "Le Principe Du Plaisir", (The Pleasure Principle). The album cover also bears a striking resemblence to the Ultravox Single “Quiet Men” (also designed by Foxx). Although no promotional singles were realeased, the dance-fuelled “Nightlife” was featured on the Modern Art compilation, a few months ahead of the album’s release. The Pleasures of Electricity was remastered, reissued and even re-worked in parts, for the 2009 double disc release. As well as featuring expanded artwork containing all the lyrics, the remaster of the album contained four tracks with new parts added (listed as alternative mixes in the tracklisting above). These new sections ranged from new riffs, to new bass and percussion elements and the occasional melody line, where the original was perhaps a little sparse. The second disc contains the album as per the original release, but with two previously unreleased bonus tracks. "Screenplay" opens with haunting notes very similar to "Touch and Go" from Metamatic, but lyrically it closely follows "Cinemascope", as if almost a continuation of the song. The disc finishes with "Twilight Room", almost a ballad, featuring one of Foxx's most emotive and vulnerable vocals. Atmospheric, emotive and typically Foxx, The Pleasures of Electricity forms the perfect soundtrack to a dreamy film yet to be made, and is a pivotal album in Foxx’s unique and diverse discography.